How to install a BEAM Central Vacuum? Professional installation or do-it-yourself? New or existing homes? to your walls. There’s no outside venting required. See your local dealer for installation details. a BEAM Central Vacuum System. You’ll want to discuss locations for the power unit/dirt collection canister, the vacuum inlets (where the hose is inserted), and a place to store a hose and attachment kit on each level. Simply enlarging a closet or including an extra base cabinet is all it takes. If your builder is familiar with BEAM, he may suggest a VacPan® automatic dustpan in the kitchen, near exterior doors, in family or laundry rooms, or wherever you’re planning hard-surface floors. Installation of your BEAM system is done after plumbing and electrical work is completed and before wallboard is installed. If your builder is not currently installing BEAM systems, check out our BEAM Dealer Locator feature on this web site to find the dealer nearest you. Your dealer can do the job quickly and competently. See your local dealer for installation details. Or, you may opt to install your BEAM Central Vacuum System on your own. Check out the Do-It-Yourself installation page for step-by-step instructions. vacuum cleaning flexibility only a central vacuum system offers. Dealer will allow you to add a BEAM Central Vacuum System to your plans inexpensively. Your BEAM dealer/distributor can provide professional installation by trained, experienced installers — an important advantage in a system you’ll be using for perhaps the next 25 years. Plan the piping installation from the BEAM power unit to the inlet valves. It’s best to run the piping under the floor if possible. 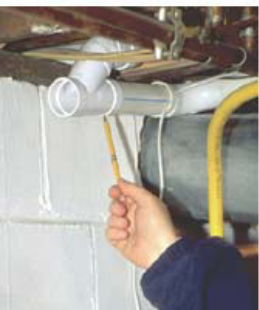 In structures without basements, the piping may be run through the attic or crawlspaces. In an existing two- or three-story home, vacuum piping may be run to upper levels through cold air ducts, through the back of closets or under stairways, or beside a soil pipe. 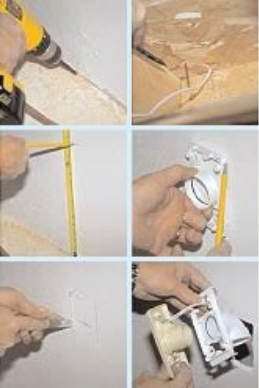 In new structures, pipe can be run through wall studs before drywall is applied. Be sure to plan where to locate the BEAM power unit — usually in the garage or basement. Use 2-1/4” wood boring bit similar to a Forstner bit. Measure the length of pipe, making sure your cuts are straight and clean. Use a sharp knife or sandpaper to eliminate burrs that might collect dust or hair that could form a dirt trap. Starting with the inlet valve farthest from the power unit, begin test fitting then gluing together sections of piping. Join sections of piping to the main trunk line that ties into the BEAM power unit. Splice together the low voltage wires along the trunk line. Run and connect the trunk line to the BEAM power unit. If mounting the power unit in the garage, drill a pilot hole through the wall using a wire coat hanger to check location and for obstructions. Then cut a 2 1/2” hole though the wooden joist above the masonry wall between the basement and the garage. Feed piping into garage to unit. Mount the BEAM power unit using detailed instructions included with it. Strip the ends of the low voltage wire coming into the garage and connect them to the power unit. Plug the power unit into an electrical outlet and flip the manual override switch on/off to test it. Then plug in the lightweight hose to clean up any minor mess you may have made installing the inlets. Congratulations! You’re on your way to a cleaner, healthier home!